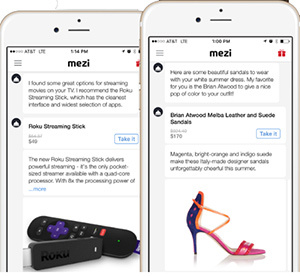 Artificial intelligence chatbot shopping app Mezi, operated by Mez Mobile Inc., has raised $9 million (Rs 60 crore) in Series A funding from Saama Capital, American Express Ventures and existing investor Nexus Venture Partners. Amit Singhal, former senior vice president and head of Google Search, and Gokul Rajaram, product engineering lead at Square, are joining as angel investors, the company said in a statement. The company will use the funds to accelerate its product and artiï¬cial intelligence technology development around conversational commerce, artiï¬cial intelligence (AI), natural language processing and machine learning, the statement said. "We see the next generation of unicorns emerging from the chatbot and artiï¬cial intelligence space, and Mezi is developing core technologies that produce humanistic and engaging chatbots," said Ash Lilani, managing partner and co-founder Saama Capital. Launched in December 2015, Mezi's personal assistant app is powered to learn shopping preferences and create a personalised experience over messaging. It powers this via its proprietary technologies Smart Connect and Smart Assist, which are built using AI, deep learning, and natural language processing. Mezi bots can even mimic speech patterns by learning from user conversations. On Mezi, travel bookings account for 25% of all purchases, fashion items 21% and gifting products 15%. Mezi was founded by twin brothers Swapnil Shinde (CEO) and Snehal Shinde (CTO), and is based in Sunnyvale, California. The app is available on iOS and via SMS. Prior to founding Mezi, the duo had launched a music streaming venture Dhingana in 2007. It raised an undisclosed amount from Inventus Capital Partners and Helion Venture Partners in 2011. In October 2012, it secured $7 million in Series B, led by Lightspeed Venture Partners. Existing investors Inventus and Helion also participated in that round. As per the last update, Dhingana had crossed 9 million users globally and had also launched its paid subscription model in July 2013. In March 2014, San Francisco-based digital music service Rdio had acquired Dhingana, a month after the latter announced it had shut shop. Dhingana founders had joined the executive team at Rdio. However, late last year Rdio too shut down and its assets were picked up by Pandora. AI-based startups that have recently raised funding include Bangalore-based Niki.ai, which received an undisclosed amount of investment from Ratan Tata and Unilazer Ventures in May. In June, Gurgaon-based Staqu raised funding from the Indian Angel Network. While Niki.ai's bot allows users to place order through a chat interface, Staqu's technology is aimed at e-commerce firms for image search, tag generation and real time recommendation. Global technology giants Facebook, Microsoft, Google and Amazon have introduced chatbots on their platforms. Recently, Facebook announced that over 11,000 bots have been added to its Messenger platform and 23,000 developers have been added to its Wit.ai Bot Engine.